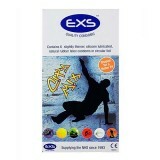 EXS City Mix Condoms. Contains 6 quality, slightly thinner, silicone lubricated, natural rubber latex condoms. City mix condoms come in a urban art decorated circular foil wrapper. Supplying the NHS since 1993. CE Qulaity marked. ..
Assorted Condoms from Skins. No Lube Smell Clear Condoms Natural Feel Extra Lubricated Packs contain natural, dots & ribs and ultra thin condoms. Never go in without a skin® ..